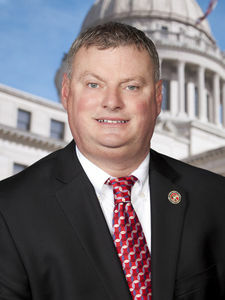 Jeffery Scott Hale, known as Jeff Hale (born August 8, 1966) is a salesman from Nesbit, Mississippi, who is a Republican state representative for District 24 in DeSoto County in the northwestern portion of his state. The son of a hair stylist and a truck driver for General Motors, Hale was educated at Northwest Mississippi Community College in Senatobia in Tate County and the Mississippi Fire Academy in the capital city of Jackson. He is a retired firefighter. He is a member of the Cornerstone Assembly of God Church in Southaven in DeSoto County. He and his wife, the former Traci Sims, have three children. In 2015, Hale narrowly defeated intra-party rival Rob Gouty in the Republican runoff primary. The adjusted vote of provisional ballots gave Hale a margin of 13 votes, 1,672 to 1,659. He then ran unopposed in the November 3 general election. The position opened when the Democratic incumbent, Mark Kevin Horan, an attorney from Grenada, was transferred to District 34. Hale serves on these House committees: (1) Public Property (vice chairman), (2) Apportionment and Elections, (3) Banking and Financial Services, and (4) Drug Policy. In 2016, he voted to prohibit dismemberment abortions in Mississippi. He voted to grant civil and criminal immunity to those reporting what they believe are instances of terrorism. He co-sponsored legislation to permit churches to have designated personnel with firearms. He voted to guarantee protections for religious beliefs and matters of moral conscience. In 2017, Hale co-sponsored the measures to authorize additional methods of execution in Mississippi and to classify the killing of first responders as first-degree murder. ↑ 1.0 1.1 Jeff Hale. Billstatus.ls.state.ms.us. Retrieved on October 10, 2017. ↑ Jeff Hale's Biography. Project Vote Smart. Retrieved on October 10, 2017. ↑ Hale winner after affidavit count. The DeSoto Times (August 26, 2015). Retrieved on October 10, 2017. ↑ Kevin Horan (Mississippi). Ballotpedia.org. Retrieved on October 10, 2017. ↑ Jeff Hale's Voting Record. Project Vote Smart. Retrieved on October 10, 2017. This page was last modified on 7 May 2018, at 10:08.